Labor unions in the United States are organizations that represent workers in many industries recognized under US labor law. Their activity today centers on collective bargaining over wages, benefits, and working conditions for their membership, and on representing their members in disputes with management over violations of contract provisions. Larger trade unions also typically engage in lobbying activities and electioneering at the state and federal level. In 2016, there were 14.6 million members in the U.S., down from 17.7 million in 1983. The percentage of workers belonging to a union in the United States (or total labor union "density") was 10.7%, compared to 20.1% in 1983. Union membership in the private sector has fallen under 7% — levels not seen since 1932. From a global perspective, the density in 2013 was 7.7% in France, 18.1% in Germany, 27.1% in Canada, and 88.9% in Iceland, which is currently highest in the world of major industrialized nations. The only country higher is the Vatican City State, which is 100% unionized among its lay employees. Although much smaller compared to their peak membership in the 1950s, American unions remain a political factor, both through mobilization of their own memberships and through coalitions with like-minded activist organizations around issues such as immigrant rights, trade policy, health care, and living wage campaigns. Of special concern are efforts by cities and states to reduce the pension obligations owed to unionized workers who retire in the future. Republicans elected with Tea Party support in 2010, most notably Governor Scott Walker of Wisconsin, have launched major efforts against public sector unions due in part to state government pension obligations (even though Wisconsin's state pension is 100% funded) along with the allegation that the unions are too powerful. States with higher levels of union membership tend to have higher median incomes and standards of living. It has been asserted by scholars and the International Monetary Fund that rising income inequality in the United States is directly attributable to the decline of the labor movement and union membership. Knights of Labor's seal: "An injury to one is a concern to all." American labor unions benefited greatly from the New Deal policies of Franklin Delano Roosevelt in the 1930s. The Wagner Act, in particular, legally protected the right of unions to organize. Unions from this point developed increasingly closer ties to the Democratic Party, and are considered a backbone element of the New Deal Coalition. Pro-business conservatives gained control of Congress in 1946, and in 1947 passed the Taft-Hartley Act, drafted by Senator Robert A. Taft. President Truman vetoed it but the Conservative coalition overrode the veto. The veto override had considerable Democratic support, including 106 out of 177 Democrats in the House, and 20 out of 42 Democrats in the Senate. The law, which is still in effect, banned union contributions to political candidates, restricted the power of unions to call strikes that "threatened national security," and forced the expulsion of Communist union leaders (the Supreme Court found the anti-communist provision to be unconstitutional, and it is no longer in force). The unions campaigned vigorously for years to repeal the law but failed. During the late 1950s, the Landrum Griffin Act of 1959 passed in the wake of Congressional investigations of corruption and undemocratic internal politics in the Teamsters and other unions. In 1955, the two largest labor organizations, the AFL and CIO, merged, ending a division of over 20 years. AFL President George Meany became President of the new AFL-CIO, and AFL Secretary-Treasurer William Schnitzler became AFL-CIO Secretary-Treasurer. The draft constitution was primarily written by AFL Vice President Matthew Woll and CIO General Counsel Arthur Goldberg, while the joint policy statements were written by Woll, CIO Secretary-Treasurer James Carey, CIO vice presidents David McDonald and Joseph Curran, Brotherhood of Railway Clerks President George Harrison, and Illinois AFL-CIO President Reuben Soderstrom. The percentage of workers belonging to a union (or "density") in the United States peaked in 1954 at almost 35% and the total number of union members peaked in 1979 at an estimated 21.0 million. Membership has declined since, with private sector union membership beginning a steady decline that continues into the 2010s, but the membership of public sector unions grew steadily. After 1960 public sector unions grew rapidly and secured good wages and high pensions for their members. While manufacturing and farming steadily declined, state- and local-government employment quadrupled from 4 million workers in 1950 to 12 million in 1976 and 16.6 million in 2009. Adding in the 3.7 million federal civilian employees, in 2010 8.4 million government workers were represented by unions, including 31% of federal workers, 35% of state workers and 46% of local workers. By the 1970s, a rapidly increasing flow of imports (such as automobiles, steel and electronics from Germany and Japan, and clothing and shoes from Asia) undercut American producers. By the 1980s there was a large-scale shift in employment with fewer workers in high-wage sectors and more in the low-wage sectors. Many companies closed or moved factories to Southern states (where unions were weak), countered the threat of a strike by threatening to close or move a plant, or moved their factories offshore to low-wage countries. The number of major strikes and lockouts fell by 97% from 381 in 1970 to 187 in 1980 to only 11 in 2010. On the political front, the shrinking unions lost influence in the Democratic Party, and pro-Union liberal Republicans faded away. Union membership among workers in private industry shrank dramatically, though after 1970 there was growth in employees unions of federal, state and local governments. The intellectual mood in the 1970s and 1980s favored deregulation and free competition. Numerous industries were deregulated, including airlines, trucking, railroads and telephones, over the objections of the unions involved. The climax came when President Ronald Reagan—a former union president—broke the Professional Air Traffic Controllers Organization (PATCO) strike in 1981, dealing a major blow to unions. Republicans began to push through legislative blueprints to curb the power of public employee unions as well as eliminate business regulations. Today most labor unions in the United States are members of one of two larger umbrella organizations: the American Federation of Labor–Congress of Industrial Organizations (AFL-CIO) or the Change to Win Federation, which split from the AFL-CIO in 2005-2006. Both organizations advocate policies and legislation favorable to workers in the United States and Canada, and take an active role in politics favoring the Democratic party but not exclusively so. The AFL-CIO is especially concerned with global trade and economic issues. Private sector unions are regulated by the National Labor Relations Act (NLRA), passed in 1935 and amended since then. The law is overseen by the National Labor Relations Board (NLRB), an independent federal agency. Public sector unions are regulated partly by federal and partly by state laws. In general they have shown robust growth rates, because wages and working conditions are set through negotiations with elected local and state officials. A review conducted by the federal government on pay scale shows that employees in a labor union earn up to 33% more income than their nonunion counterparts, as well as having more job security, and safer and higher-quality work conditions. The median weekly income for union workers was $973 in 2014, compared with $763 for nonunion workers. Once the union has won the support of a majority of the bargaining unit and is certified in a workplace, it has the sole authority to negotiate the conditions of employment. Under the NLRA, employees can also, if there is no majority support, form a minority union which represents the rights of only those members who choose to join. Businesses, however, do not have to recognize the minority union as a collective bargaining agent for its members, and therefore the minority union's power is limited. This minority model was once widely used, but was discarded when unions began to consistently win majority support. Unions are beginning to revisit the members-only model of unionism, because of new changes to labor law, which unions view as curbing workers' ability to organize. Right-to-work statutes forbid unions from negotiating union shops and agency shops. Thus, while unions do exist in "right-to-work" states, they are typically weaker. Unions report that, under the present system, many employers use the 45- to 90-day period to conduct anti-union campaigns. Some opponents of this legislation fear that removing secret balloting from the process will lead to the intimidation and coercion of workers on behalf of the unions. During the 2008 elections, the Employee Free Choice Act had widespread support of many legislators in the House and Senate, and of the President. Since then, support for the "card check" provisions of the EFCA subsided substantially. At the apex of union density in the 1940s, only about 9.8% of public employees were represented by unions, while 33.9% of private, non-agricultural workers had such representation. In this decade, those proportions have essentially reversed, with 36% of public workers being represented by unions while private sector union density had plummeted to around 7%. The US Bureau of Labor Statistics most recent survey indicates that union membership in the US has risen to 12.4% of all workers, from 12.1% in 2007. For a short period, private sector union membership rebounded, increasing from 7.5% in 2007 to 7.6% in 2008. However, that trend has since reversed. In 2013 there were 14.5 million members in the U.S., compared with 17.7 million in 1983. In 2013, the percentage of workers belonging to a union was 11.3%, compared to 20.1% in 1983. The rate for the private sector was 6.4%, and for the public sector 35.3%. In the ten years 2005 through 2014, the National Labor Relations Board recorded 18,577 labor union representation elections; in 11,086 of these elections (60 percent), the majority of workers voted for union representation. Most of the elections (15,517) were triggered by employee petitions for representation, of which unions won 9,933. Less common were elections caused by employee petitions for decertification (2792, of which unions won 1070), and employer-filed petitions for either representation or decertification (268, of which unions won 85). In the US, labor education programs such as the Harvard Trade Union Program created in 1942 by Harvard University professor John Thomas Dunlop sought to educate union members to deal with important contemporary workplace and labor law issues of the day. The Harvard Trade Union Program is currently part of a broader initiative at Harvard Law School called the Labor and Worklife Program that deals with a wide variety of labor and employment issues from union pension investment funds to the effects of nanotechnology on labor markets and the workplace. Cornell University is known to be one of the leading centers for labor education in the world, establishing the Cornell University School of Industrial and Labor Relations in 1945. The school's mission is to prepare leaders, inform national and international employment and labor policy, and improve working lives through undergraduate and graduate education. The school publishes the Industrial and Labor Relations Review and had Frances Perkins on its faculty. The school has six academic departments: Economics, Human Resource Management, International and Comparative Labor, Labor Relations, Organizational Behavior, and Social Statistics. Classes include "Politics of the Global North" and "Economic Analysis of the University." Labor unions use the term jurisdiction to refer to their claims to represent workers who perform a certain type of work and the right of their members to perform such work. For example, the work of unloading containerized cargo at United States ports, which the International Longshoremen's Association, the International Longshore and Warehouse Union and the International Brotherhood of Teamsters have claimed rightfully should be assigned to workers they represent. A jurisdictional strike is a concerted refusal to work undertaken by a union to assert its members' right to such job assignments and to protest the assignment of disputed work to members of another union or to unorganized workers. Jurisdictional strikes occur most frequently in the United States in the construction industry. Although not as overwhelmingly supportive as it was from the 1930s through the early 1960s, a clear majority of the American public approves of labor unions. The Gallup organization has tracked public opinion of unions since 1936, when it found that 72 percent approved of unions. The overwhelming approval declined in the late 1960s, but - except for one poll in 2009 in which the unions received a favorable rating by only 48 percent of those interviewed, majorities have always supported labor unions. The latest poll in August 2016 gave labor unions a 56 percent approval rating, versus 36 percent who disapproved of unions. A Gallup Poll released August 2018 showed 62% of respondents supporting unions, the highest level in over a decade. On the question of whether or not unions should have more influence or less influence, Gallup has found the public consistently split since Gallup first posed the question in 2000, with no majority favoring either more influence or less influence. In August 2016, 36 percent wanted unions to have more influence, 34 percent less influence, with 26 percent wanting the influence of labor unions to remain about the same. 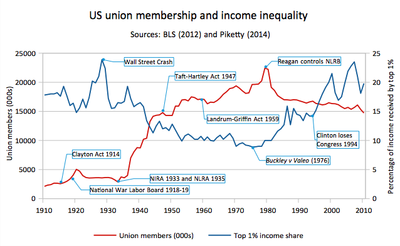 As union membership declined income inequality rose. The US does not require employee representatives on boards of directors, or elected work councils. Although most industrialized countries have seen a drop in unionization rates, the drop in union density (the unionized proportion of the working population) has been more significant in the United States than elsewhere. Public approval of unions climbed during the 1980s much as it did in other industrialized nations, but declined to below 50% for the first time in 2009 during the Great Recession. It is not clear if this is a long term trend or a function of a high unemployment rate which historically correlates with lower public approval of labor unions. One explanation for loss of public support is simply the lack of union power or critical mass. No longer do a sizable percentage of American workers belong to unions, or have family members who do. Unions no longer carry the "threat effect": the power of unions to raise wages of non-union shops by virtue of the threat of unions to organize those shops. A historical comparison of union membership as a percentage of all workers and union support in the U.S.
A New York Times/CBS Poll found that 60% of Americans opposed restricting collective bargaining while 33% were for it. The poll also found that 56% of Americans opposed reducing pay of public employees compared to the 37% who approved. The details of the poll also stated that 26% of those surveyed, thought pay and benefits for public employees were too high, 25% thought too low, and 36% thought about right. Mark Tapscott of the Washington Examiner criticized the poll, accusing it of over-sampling union and public employee households. 55% of Americans believed that labor unions will become weaker in the United States as time goes by, an all-time high. This compared to 22% who said their power would stay the same, and 20% who said they would get stronger. A broad range of forces have been identified as potential contributors to the drop in union density across countries. Sano and Williamson outline quantitative studies that assess the relevance of these factors across countries. The first relevant set of factors relate to the receptiveness of unions' institutional environments. For example, the presence of a Ghent system (where unions are responsible for the distribution of unemployment insurance) and of centralized collective bargaining (organized at a national or industry level as opposed to local or firm level) have both been shown to give unions more bargaining power and to correlate positively to higher rates of union density. More recently, as unions have become increasingly concerned with the impacts of market integration on their well-being, scholars have begun to assess whether popular concerns about a global "race to the bottom" are reflected in cross-country comparisons of union strength. These scholars use foreign direct investment (FDI) and the size of a country's international trade as a percentage of its GDP to assess a country's relative degree of market integration. These researchers typically find that globalization does affect union density, but is dependent on other factors, such as unions' access to the workplace and the centralization of bargaining. Sano and Williamson argue that globalization's impact is conditional upon a country's labor history. In the United States in particular, which has traditionally had relatively low levels of union density, globalization did not appear to significantly affect union density. Goldfield writes that the overall effects of globalization on unionization in the particular case of the United States may be understated in econometric studies on the subject. He writes that the threat of production shifts reduces unions' bargaining power even if it does not eliminate them, and also claims that most of the effects of globalization on labor's strength are indirect. They are most present in change towards a neoliberal political context that has promoted the deregulation and privatization of some industries and accepted increased employer flexibility in labor markets. However, Mayer has written that it was precisely unions' opposition to NAFTA overall that jeopardized organized labor's ability to influence the debate on labor standards in a significant way. During Clinton's presidential campaign, labor unions wanted NAFTA to include a side deal to provide for a kind of international social charter, a set of standards that would be enforceable both in domestic courts and through international institutions. Mickey Kantor, then U.S. trade representative, had strong ties to organized labor and believed that he could get unions to come along with the agreement, particularly if they were given a strong voice in the negotiation process. When it became clear that Mexico would not stand for this kind of an agreement, some critics from the labor movement would not settle for any viable alternatives. In response, part of the labor movement wanted to declare their open opposition to the agreement, and to push for NAFTA's rejection in Congress. Ultimately, the ambivalence of labor groups led those within the Administration who supported NAFTA to believe that strengthening NAFTA's labor side agreement too much would cost more votes among Republicans than it would garner among Democrats, and would make it harder for the United States to elicit support from Mexico. Graubart writes that, despite unions' open disappointment with the outcome of this labor-side negotiation, labor activists, including the AFL-CIO have used the side agreement's citizen petition process to highlight ongoing political campaigns and struggles in their home countries. He claims that despite the relative weakness of the legal provisions themselves, the side-agreement has served a legitimizing functioning, giving certain social struggles a new kind of standing. Unions have recently been engaged in a developing field of transnational labor regulation embodied in corporate codes of conduct. However, O'Brien cautions that unions have been only peripherally involved in this process, and remain ambivalent about its potential effects. They worry that these codes could have legitimizing effects on companies that do not actually live up to good practices, and that companies could use codes to excuse or distract attention from the repression of unions. Unions have made some attempts to organize across borders. Eder observes that transnational organizing is not a new phenomenon but has been facilitated by technological change. Nevertheless, he claims that while unions pay lip service to global solidarity, they still act largely in their national self-interest. He argues that unions in the global North are becoming increasingly depoliticized while those in the South grow politically, and that global differentiation of production processes leads to divergent strategies and interests in different regions of the world. These structural differences tend to hinder effective global solidarity. However, in light of the weakness of international labor, Herod writes that globalization of production need not be met by a globalization of union strategies in order to be contained. Herod also points out that local strategies, such as the United Auto Workers' strike against General Motors in 1998, can sometimes effectively interrupt global production processes in ways that they could not before the advent of widespread market integration. Thus, workers need not be connected organizationally to others around the world to effectively influence the behavior of a transnational corporation. A 2018 study in the Economic History Review found that the rise of labor unions in the 1930s and 1940s reduced income inequality. ^ a b See: Trade Union Density. OECD. StatExtracts. Retrieved: 1 January 2017. ^ "The Holy See - The Roman Curia - Labour Office of the Apostolic See". www.vatican.va. ^ Nelson Lichtenstein, "Can This Election Save the Unions?," Dissent Summer 2012. ^ Politics that Work (April 3, 2015). Union Membership and Median Income. Retrieved April 18, 2015. ^ Politics that Work (April 3, 2015). Union Membership and Standard of Living. Retrieved April 18, 2015. ^ Keith Naughton, Lynn Doan and Jeffrey Green (February 20, 2015). As the Rich Get Richer, Unions Are Poised for Comeback. Bloomberg. Retrieved February 20, 2015. ^ Benjamin C. Waterhouise, Lobbying in America, (Princeton University Press, 2013) 53. ^ William H. Holley et al.Jr. (2011). The Labor Relations Process, 10th ed. Cengage Learning. p. 85. ^ a b Aaron Brenner; et al. (2011). The Encyclopedia of Strikes in American History. M.E. Sharpe. pp. 234–35. ^ a b c "Union Members Summary". Bls.gov. Retrieved 14 October 2017. ^ Schultz, Duane P. Schultz, Sydney Ellen (2010). Psychology and work today : an introduction to industrial and organizational psychology (10th ed.). Upper Saddle River, N.J.: Prentice Hall. pp. 271–272. ISBN 978-0205683581. ^ Morris, Charles J. "Charles J. Morris on Labor Relations". Retrieved 2018-09-25. ^ Moshe Mavit, Leigh Anne Schriever (October 21, 2015). "With Traditional Unions on the Decline, Can Members-Only Unions Breathe Life Back Into Labor?". In These Times. ^ Elk, Mike (2017-04-28). "Can unions rebuild the labor movement in the US south?". the Guardian. Retrieved 2018-09-25. ^ Bureau of Labor Statistics (January 25, 2008). "Union members in 2007" (PDF). Washington, D.C.: U.S. Department of Labor. Greenhouse, Steven (January 26, 2008). "Union membership sees biggest rise since '83". The New York Times. p. A11. Freeman, Sholnn (January 26, 2008). "Union membership up slightly in 2007; Growth was biggest in Western states; Midwest rolls shrank with job losses". The Washington Post. p. D2. ^ Representation petitions, National Labor Relations Board, accessed 10 Oct. 2015. ^ Decertification petitions, National Labor Relations Board, accessed 10 Oct. 2015. ^ "Labor and Worklife Program". Law.harvard.edu. Retrieved 14 October 2017. ^ "About the ILR School". Retrieved 2007-06-13. ^ Meyerson, Harold (September 3, 2018). "Like frogs in a slowly boiling pot, Americans are finally realizing how dire their labor situation is". The Los Angeles Times. Retrieved September 5, 2018. ^ Lydia Saad, Labor Unions, Gallup, accessed 25 March 2017. ^ Jelle Visser, Union membership statistics in 24 countries, Monthly Labor Review, Jan. 2006, p.38-49. ^ Tapscott, Mark (March 1, 2011). "CBS News/New York Times survey oversampled union households". Washington Examiner. Retrieved March 2, 2011. ^ Sano, Joelle and John B. Williamson. (2008) "Factors Affecting Union Decline and their Implications for Labor Reform." International Journal of Comparative Sociology 49: 479-500. ^ Goldfield, Michael. "The impact of globalization and neoliberalism on the decline of organized labour in the United States" in Labor, Globalization and the State: Workers, women and migrants confront neoliberalism ed. by Banerjee, Debdas and Michael Goldfield, (Routledge, 2007). ^ Bolle, Mary Jane. "DR-CAFTA Labor Rights Issues." Congressional Research Service Report for Congress Order Code RS22159. 8 Jul 2005. ^ a b c "CIAO". Ciaonet.org. Retrieved 14 October 2017. ^ Graubart, Jonathan. Legalizing Transnational Activism: The Struggle to Gain Social Change from NAFTA's Citizen Petitions (Pennsylvania State University Press, 2008). ^ O'Brien, Robert. "The varied paths to minimum global labour standards." Global Unions? Theory and Strategies of organized labour in the global political economy ed by Harrod, Jeffrey and Robert O'Brien, (Routledge, 2002). ^ Eder, Mine. "The constraints on labour internationalism: contradictions and prospects." in Global Unions? Theory and Strategies of organized labour in the global political economy ed Harrod, Jeffrey and Robert O'Brien, (Routledge, 2002). ^ Herod, Andrew. "Organizing globally, organizing locally: union spatial strategy in a global economy." in Global Unions? Theory and Strategies of organized labour in the global political economy ed Harrod, Jeffrey and Robert O'Brien, (Routledge, 2002). ^ Collins, William J.; Niemesh, Gregory T. "Unions and the Great Compression of wage inequality in the US at mid-century: evidence from local labour markets". The Economic History Review. 0 (0). doi:10.1111/ehr.12744. ISSN 1468-0289. Unions still matter (April 2015), Sean McElwee, Al Jazeera America. Americans Don't Miss Manufacturing – They Miss Unions. FiveThirtyEight, May 13, 2016. The Economic Outlook for Millennials Is Bleak. Now They’re Unionizing in Record Numbers. Mother Jones. February 9, 2018.